Third base has just been a minefield of excrement recently. Yes, I said excrement. Jose Bautista has a bum neck, Ryan Zimmerman is out for another 6 weeks, Alex Rodriguez is on again off again with a variety of ailments, Pablo Sandoval is gone for breaking the bone all baseball players should have surgically removed, and even David Freese got in on the act with a broken hand of his own. Howard did a nice job of griping about third base on Thursday so I won’t try to continue that particular rant. What I’d like to do is look at a couple of players that some of us have had to turn to as we wait for something better to come along. I’ll admit that I have a dream where I’ll someday be able to introduce Hannahan to Joel Hanrahan and Adam Dunn in my best Leslie Nielsen Airplane deadpan: “Hannahan, Hanrahan; Hanrahan, Hannahan; Hannahan, Hanrahan – Dunn.” But that will have to wait for my first NotGraphs post. In a previous comment thread, a reader posited that Jack Hannahan was his solution for the loss of Pablo Sandoval. After a moment of abject terror in thinking that Jack Hannahan actually occupied a roster spot on a fantasy baseball team, let alone started, I spent a little additional time digging into his early season uprising that resembles nothing like the previous house that Jack built. How different is this house, you ask? What’s interesting is he’s not getting especially lucky inasmuch as BABIP is involved. His BABIP currently sits at .303 and his expected BABIP is .319. His career BABIP is .292. The expectation has a lot to do with an elevated ground ball rate with about a 46% rate versus a 39% career line. Though his fly balls are down, his HR/FB is at 16% versus a 7.1% career rate. This figure in particular is likely to regress to career norms. The tough part about Hannahan is that citing “career” offensive numbers is a tad spurious as his career is really as a defensive journeyman. He only has just a little over 1000 total plate appearances, giving us about the equivalent of a couple years worth of full time play — enough to draw some conclusions, but practically speaking he’s only had one full continuous year of major league at bats. If you look at his 405 games total at AAA, you get a .269 hitter with a decent eye and a penchant for strikeouts, which sounds a heck of a lot like the Jack we all know. He hit 37 HR’s and 86 doubles over 1660 plate appearances in AAA, so there wasn’t any particular year that he really raked, other than perhaps with the Toledo Mud Hens in 2007, but that was that same team that made Timo Perez look like Ken Griffey. 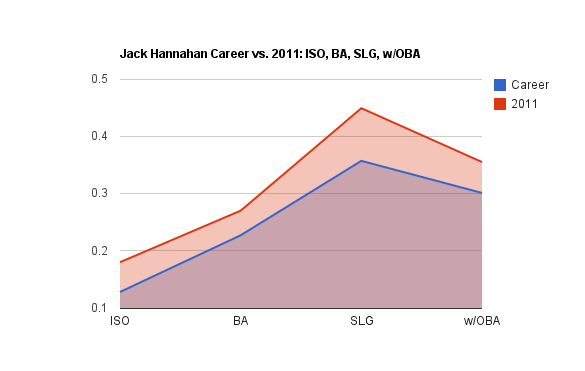 But the fact that I’ve spent this much time talking about Jack Hannahan means that inexplicably he’s at least worth talking about. At an absolute minimum he has surprised a lot of people (my money says that includes Manny Acta) with his bat, and while it would fly in the face of logic, if your team really needs someone, he could continue to hit on a level that makes him worth a roster spot. Looking at ZiPS, they think he could contribute a few HR’s the rest of the season with 7 and even a fair amount of runs at 41, but they also predict just 38 RBI (which means he’s already accounted for 40% of his total RBI production) and a .226 batting average which is something that I just can’t recommend anyone putting up with. I can’t think of Betemit without hearing Chris Berman singing Pearl Jam’s “Better Man” during a highlight: “Can’t find a Betemit…” Painful is what it is. Betemit had a 2010 that was certainly notable — .297/.378/.511 with 13 HR and 43 RBI in just 315 plate appearances. A lot of that was chalked up to a good degree of luck via BABIP and most viewed him as a placeholder for one of the dozen blue chippers coming up through the Royals system and his days as a regular were numbered. But here we are, talking about Wilson Betemit again. Along with many Royals, he’s off to a surprising start, hitting .322/.374/.483 with a home run and contributing nicely in both RBI and R with 16 and 14, respectively. He’s still striking out a ton, and there’s not an appreciable difference in his hit trajectory versus career averages, so there’s not much in the way of a change in approach. His BABIP of .415 isn’t sustainable, but his expected BABIP is .316 and considering his career BABIP is .336, it stands to reason that he just might give you a decent batting average, say .275-ish, going forward. Whether Betemit is a decent stopgap likely has a lot to do with the depth of your league. You still have to believe he’s just keeping the seat warm for Mike Moustakas, and given Betemit’s relatively cheap contract, it seems to reason that he may not even be a Royal all year and fall back into a journeyman role for a contender in a couple months. But hey, right now, the Royals are a contender. ZiPS predicts 8 more home runs, 40 RBI, and a middling batting average — really nothing to get any particular garment in a bunch. You might be better off trying to trade for a third baseman off to a horrible start instead (see: Chris Johnson, Chone Figgins, Pedro Alvarez). We hoped you liked reading Jack Hannahan and Wilson Betemit as Stopgap Measures at Third Base by Michael Barr! To continue the excrement theme, don’t overlook Aramis Ramirez’ poo-filled season to date, as he’s doing his best Nick Punto impersonation. Brandon Wood, anyone?